The risk of customer bad debts is rising as there has been an increase in both corporate and personal insolvencies. 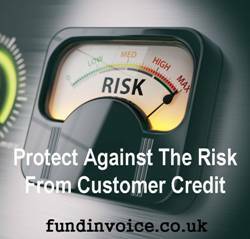 It is time to protect your business against the risk from customers taking trade credit. Protection against taking customer bad debts is still on offer at present. An article in The Times dated 28th July 2018 reported that personal insolvencies in England and Wales have hit a 6 year high. The rise was attributed to rising inflation set against low wage rises and growing levels of debt. In the last 3 months there has been a 27% jump in the number of people becoming insolvent, when compared to the same period last year. A worrying, and significant trend. The Office for National Statistics (ONS) reported that, for the first time in 30 years, families are spending, on average, £900 more than they are earning each year. Coupled with this increase in personal insolvency is an increase in similar corporate problems. The Insolvency Service statistics for Q1 2018 showed that corporate insolvency rates (excluding an adjustment for "bulk insolvencies" caused by a change in claimable expenses rules - I am not sure if that should be adjusted though as it reflects the reality of what is happening in the UK), have increased in Q1 2018 to their highest level since Q1 2014. Of 4,462 companies that entered insolvency arrangements in Q1 2018, 72% were CVLs (Creditors Voluntary Liquidations), 17.5% were Compulsory Liquidations and 11.5% were other types. If you are a company that is facing the prospect of going into liquidation, speak to us first to see if there is anything that we can do to help you avoid insolvency. In such a climate, many businesses are seeking to mitigate the risk of customer bad debts through insolvency by taking out credit insurance or bad debt protection (BDP). BDP operates in a similar way to credit insurance but is offered to users of invoice financing services as an optional add on. The financier either takes out their own blanket credit insurance policy, or takes the risk directly themselves passing on the risk mitigation benefits to their customers. Your customers are granted credit limits - the maximum level of sales invoicing that will be "covered". If the customer enters insolvency, the value of all covered invoices will be paid to you by the provider, after a pre-agreed credit period (if a prepayment has been made that is not repayable in such situations i.e. there will be no recourse. Hence the term "non recourse" is applied to these services). Note that there can be first loss clauses (similar to a first loss on your car insurance) and not all funders can offer 100% bad debt protection. In some cases it is a lower figure e.g. 90% of invoice values. This kind of risk mitigation against the risk of customers taking trade credit is still available at present, however, that does not mean that it will continue to be offered if the situation continues to deteriorate. Now is the time to protect your company against the risks of offering trade credit to customers. Retailageddon - Why Are So Many High Profile Companies In Financial Trouble?